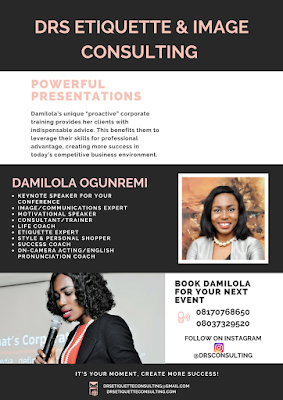 Damilola captures the attention of her audience through indispensable advice and her personal experience creates real impact in her training. She is an asset to any organization. Get the best of her speaking and consulting services for your next event and workshop. Email drsetiquetteconsulting@gmail.com or WhatsApp 📱08170768650 for booking information.